Sorting through a box of material related to Philadelphia 30th Street Station, a postcard catches the eye, its soothing blues and greens punctuated by pink. Turning it around, the description reveals that it’s a reduction of an original, limited-edition illustration by artist Tom Engeman. 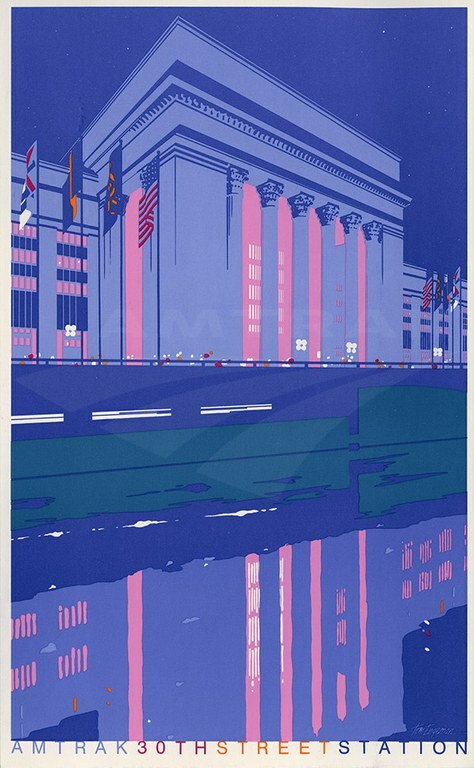 By cropping the image and taking advantage of perspective, the artist conveys the majesty of 30th Street Station, romantically reflected in the waters of the Schuylkill River. Although most people probably don’t know it, they are familiar with Engeman’s work—over the years, he has designed numerous stamps for the United States Postal Service. 30th Street Station was built between 1929 and 1933 by the Pennsylvania Railroad (PRR) to replace Broad Street Station in Center City, which had become too congested for efficient operations. Designed by the firm of Graham, Anderson, Probst and White, the enormous steel framed 30th Street Station is architecturally interesting for its use, adaptation and transformation of neoclassical elements into a more modern, streamlined Art Deco style. One of the building’s best known features is the pair of soaring porticoes on the east and west facades. The interior is notable for its stylistic and functional elements. The main concourse measures 290 by 135 feet with a soaring coffered ceiling and beautiful chandeliers. In addition to the usual passenger areas, the station originally incorporated a chapel, mortuary and hospital space. 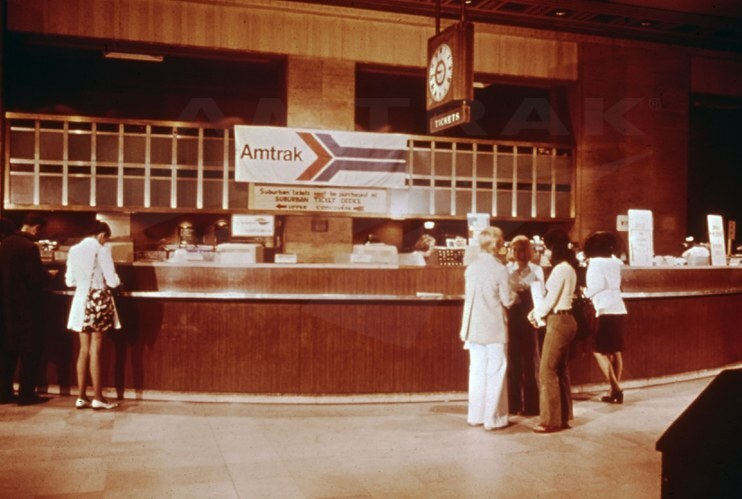 Ticketing desk at 30th Street Station in the early to mid-1970s. Works of art are located throughout the building. Visitors can find Karl Bitter's 1895 bas-relief, The Spirit of Transportation, in the North Waiting Room. It depicts the progress of transportation; a central female figure sits in a horse-drawn carriage, while children cradle models of a steamship, steam locomotive and dirigible. Also prominently displayed is Walker Hancock's Pennsylvania Railroad War Memorial, a sculpture of the archangel Michael lifting a soldier's body out of the flames of war. Cast in 1950, the memorial honors the 1,307 PRR employees who died in military service during the Second World War, out of the more than 54,000 who served. From 1988-1991, Amtrak led a $75 million development effort to renovate the station as it neared its 60th anniversary. The project included the restoration of the main concourse, with special attention given to its ceiling, chandeliers, travertine walls and massive marble columns. Above the passenger areas, 280,000 square feet of office space was modernized to house approximately 1,100 Amtrak employees. New shops and food vendors were installed in the South Arcade and South Concourse. Outside, the facades were refurbished and a former mail handling facility was converted into an underground parking garage. Amtrak and the people of Philadelphia celebrated the rehabilitation in June 1991 during a three day event that kicked off with remarks by Amtrak officials, the singing of the national anthem and the raising of flags at each entrance. Over the course of the weekend, visitors enjoyed self-guided station tours, train displays and musical performances. Philadelphia’s famous Mummers also delighted the crowds. 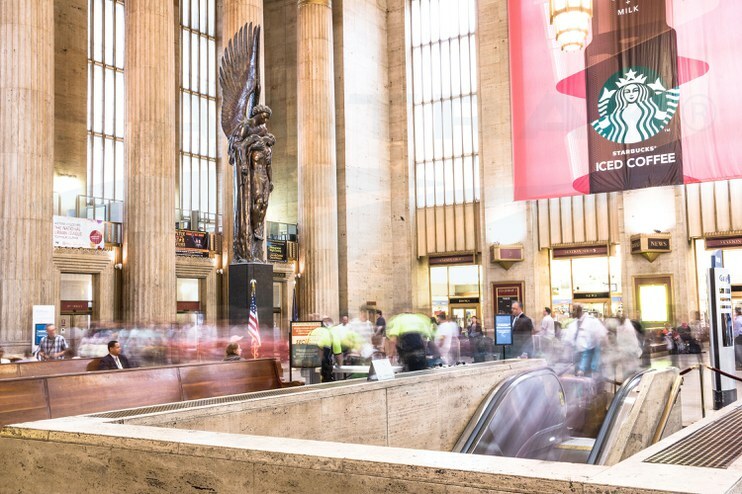 As a major transportation hub and West Philadelphia landmark, 30th Street Station continues to be an anchor for development. In early summer 2014, Amtrak, Drexel University and Brandywine Realty Trust selected Skidmore, Owings & Merrill LLP (SOM), in association with Parsons Brinckerhoff, OLIN, and HR&A Advisors, to develop a comprehensive joint master plan for the area around the station. It represents a unique opportunity to develop new plans and re-envision existing planning efforts to create a single, integrated vision for the 30th Street Station precinct. The SOM team will aim to develop a future where the station is at the epicenter of a dynamic neighborhood full of opportunities for community development, economic development and improved transportation connections. A wide range of commercial opportunities, including a new vision for retail spaces within the station and the potential development of air rights above 75 acres of adjacent rail yards, will also be considered. Development of the master plan is expected to take approximately two years. Follow the progress by visiting the 30th Street Station District Plan website. Explore additional archival material, including images and brochures, related to Philadelphia 30th Street Station. Have a favorite memory of the station? Share it with us in the comments section below.